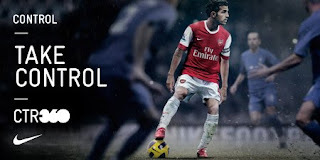 We have the boots that Arsenal's Cesc Fabregas wears. This boot promises to increase control and passing pace. It weighs 8.8 ounces and is composed of Kanga-Lite synthetic leather upper which mirrors the properties of natural Kangaroo leather, while offering durability in an easy to care for upper material. Innovative built-in features like dampening pods and asymmetrical lacing deliver maximum ball control and optimal passing-pace. High performance, molded sock-liner with Poron low profile cushioning delivers great under the foot comfort. The sole is made of Carbon fiber with direct-injected bladed studs for traction. The Carbon reinforced chassis is engineered for exceptional energy return and strength.